Yes, it's Friday again. Regular readers know what this means. The regular feature of the Friday Islay Picture. 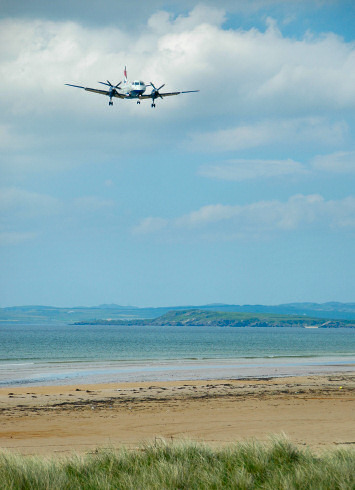 This week the picture has a little personal significance for me: For most people it will be just a plane coming in over Laggan Bay to land at Islay Airport. For me it's something special because my parents were on this particular flight. This picture was taken in June this year, my sister and me had a arrived on Islay two days earlier and with our parents arriving the family would be complete. The first time the whole Grewe family would be on Islay together. We had gambled on the plane coming in over Laggan Bay and had spent the afternoon on the Big Strand, our gamble paid off when the plane came in as expected and we were able to take a few nice pictures of the landing. And finally this picture is a reminder to myself to make some progress with the Two weeks on Islay in June 2007 travelogue. The page with the day where my parents arrived is the next one to complete, so I'm trying to put some pressure on myself to just get on with it. Have a great weekend, regardless if you're flying to Islay or not!